Announcing Card Delegation & Pack Tokens! The Steem Monsters team has just released two new updates which we're excited to share with you. The first is the ability to delegate cards in your collection to another account, just like you can currently do with Steem Power on the Steem blockchain, and the second is the ability to convert any unopened Alpha or Beta edition booster packs into tokens on the Steem Engine platform that are tradeable on the decentralized exchange! We'll dig into each of these in more detail below. This was a feature that has been sitting on our to-do list and roadmap for a very long time, and we're excited to finally make it available to our players! Card delegation will allow you to rent or lease your cards to another player without taking on any counter-party risk. You are still the owner of any cards that are delegated, and can remove the delegation at any time, but the delegatee can use those cards to play. The idea is that a good player who doesn't have much money to spend on cards can instead rent a set of high level cards which they can use to play in ranked battle to earn reward cards or even booster packs at the end of the season, and to play in tournaments in which they can win all sorts of prizes which would not have been available to them without those cards. Similarly, the delegator can now earn a passive income from renting out their extra or unused cards! Initially card delegation is very simple. 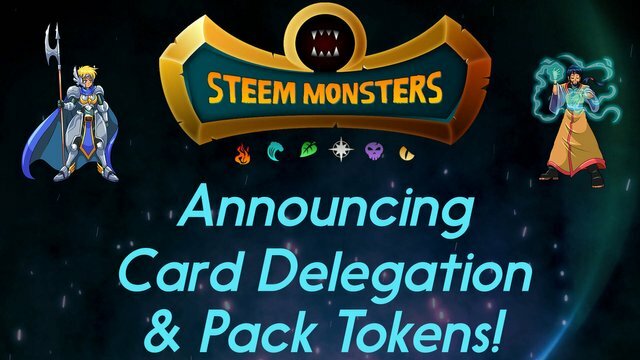 On the card details popup within the collection screen on the Steem Monsters website there is now an option to delegate cards that you own. You simply enter the account name of the player to whom you want to delegate them to and click the button and you're done. Once delegated, you'll see a small delegation icon next to the delegated cards in your collection. You can click on that icon to remove the delegation at any time. Similarly, the delegatee will now see those cards in their collection with an incoming delegation icon next to them. The delegatee will then be able to use those delegated cards on their teams in battles, and the delegator will not. Cards may not be combined, listed for sale on the market, or transferred while they are delegated to another player. When a card is un-delegated, it returns to the owner immediately, however it is subject to the same 7-day cooldown period for ranked play as if it had been transferred. This is to prevent the same set of cards from being used by multiple accounts to move up the ranked play leaderboard in a season. There is currently no cooldown period for tournament play. We are currently working with the teams at Peak Monsters as well as BuildTeam to offer a leasing market for cards where players can offer their cards for lease at a certain price and other players can browse the available leases and purchase the ones they would like. The protocol now allows for players to give delegation authority to another account which will allow it to manage their card delegations for them. This way a player can give delegation authority to the market of their choice, and the market can handle all of the delegations on the player's behalf in a completely automated fashion. Currently, just like with gifting cards, if you want to delegate many different cards through the user interface on the Steem Monsters website you must do it one card at a time, which is slow and difficult. We are currently working on a complete redesign of the card collection and market screens which, among many other improvements, will introduce the concept of "card sets". This will allow players to group any number of cards into a set and then perform transactions such as delegation or selling on the market of the entire set at once. We expect these additional features to be ready in the next few weeks. The second new feature in this update is the ability to convert any unopened Alpha or Beta edition booster packs to tokens on the Steem Engine platform. This will allow Steem Monsters booster packs to be traded on the Steem Engine decentralized exchange! On the pack opening page of the Steem Monsters website, there is now the option to convert your unopened booster packs into pack tokens. If you click on that option, you'll be asked how many packs you want to convert, and those packs will be removed from the quantity shown on that page (since packs converted to tokens cannot be opened) and the appropriate number of ALPHA or BETA tokens will be transferred to your Steem account. Similarly, at any time you can transfer any ALPHA or BETA tokens on the Steem Engine platform to the @steemmonsters account, and they will instantly show up on the Steem Monsters website and be available for you to open. This is an important step for us as it is our first integration between Steem Monsters and the Steem Engine platform. The work here will pave the way for our next integration which will be the upcoming in-game currency token, which many of you already know will be called "Dark Energy Crystals" or DEC. Previously, the contents of each booster pack were generated deterministically based on data from the blockchain at the time the packs were purchased. This caused an issue as the more tech-savvy players could then see what was in the packs before opening them. As a result, we were forced to un-publish the algorithm for generating the cards in the booster packs which decreased the level of decentralization of the game and the card assets. With this update, the cards in booster packs are now generated at the time the packs are opened. This means that opening packs now requires a transaction to the blockchain which takes a few seconds. Rather than showing the boring loading spinner during this time, we've added a slick pack opening animation created by the amazing @nateaguila. Even without requiring a blockchain transaction, a cool pack opening animation is something that is present in nearly every digital trading card game, and we feel that it adds to the excitement of opening packs. If any wants to delegate some high level summoners and monster I'm ready to receive them. I have a warm loving family home for them to stay at. But only temporary because food supplies run out quickly around here! Magic Dice has rewarded your post with a 26% upvote. Thanks for playing Magic Dice. We're working on first catching up with the new changes and implimenting some of these new features. We will then work on creating an automated market for delegation. We look forward to seeing what users do during this time that things will remain manual between players. Those that have experience delegating feel free to drop us a line letting us know how you envision an automated system and hope it matches or exceeds your hopes and dreams. Specially those that are looking forward to doing the RENTING... we need to hear from more of you. I maxed out all of my Dragons for this very reason, and I am excited to rent them out since I stay pretty busy and cannot use them to their full potential! Lot's of really exciting updates! Representing exchangeable booster packs is a great application for tokens. With this update, the cards in booster packs are now generated at the time the packs are opened. This means that opening packs now requires a transaction to the blockchain which takes a few seconds. Does the new protocol also use key stretching (e.g. PBKDF2) to prevent witnesses from being able to reveal pack contents before mining them? Thank you for being a role model for other blockchain games! When delegating cards to another player, what is the passive income the delegator receives? Cards? Nothing automated yet, AFAIK. Yet everything negotiable. I bet everyone who foolishly sold their cards to buy stuff in Drug Wars is kicking themselves now. drugwars lolol can't call it a game. I've only sold cards to buy more cards in SM. Drugwars is so lame lol wish I hadn't spent anything on it. Luckily, I only spent a little in the beginning, but now I just earn a little Steem from saving up what I produce and then investing that in producing a little more. I love where this is going. So glad I am a Steem Monster... "Master", "trainer"? Oh you know what I mean! Any thought on the idea to give the possibility to convert cards (also reward cards) to tokens that can be used to get booster packs? you mean like selling cards for STEEM and then buying boosters with STEEM ?!? Amazing work here, I am very excited to where this can take @steemmonsters moving forward! I hope that the introduction of dark energy crystals are introduced in a more limited way than packs were given out in quests and reward cards were given in quests later on as well. I know, being too nice is a great achilles heel to have, but nonetheless is still a weakness. Distributing these side by side on a limited basis for card burning, very high finishes in the highest caliber tournaments, and winning of smaller tournaments would be great in my opinion to start; In having a "teeter totter effect" of card production and dark energy crystal production and distribution. I know there is protocol that needs to followed via whitepaper and whatnot but having these crystals vastly (primarily) created based on the burning of cards would by default send card values much higher due to rarity and lack of unwanted cards rotting on the market, rather than having a hyper inflation of these crystals as many people obtain a high quantity of them out of the gate and then have lesser need for them ongoing. I think you have a serious enterprise on your hands and you are roaring out of the gate I feel it is time you continued that sentiment and made these crystals more difficult to obtain than what previous introductions of new game cards/features have done so far. Keep up the great work! This is exciting news! I'm stoked for the new players that will be able to benefit from using powerful cards and the existing players who will now be able to monetize their investment in a whole new category. The @steemmonsters team is doing excellent work and as a Steemian I'm thankful for your efforts to actually make this blockchain more fun. Thanks for this great update Steemmonsters. I hope that this will bring in more players to the community. Why not host a "Delegation Celebration Tournament" and the prizes are high level delegation cards or even Team sets? Future looks bright in the Monster Universe! Mostly max rare summoners and a few other cards. This is very exciting! Love all the new updates! This is fantastic and an awesome update @aggroed ! I really love the new pack opening annimation that was created by @nateaguila great job!! Steem Monsters is going to be EPIC!! Question @steemmonsters / @yabapmatt / @aggroed : how do we know what to rent out the cards for!? will there be a guide of some sort!? for instance , what would I charge to rent out my maxed up Level 10 Sea Genie , say per day!? I am also thinking about renting. Maybe they could buy my cards after a few seasons. good options. like the way, you guys are making good things happen. How much SP is required to rent cards? What's the cost to rent a card? Great updates across the board, adding lots of functionality! We're looking forward to possibly offering card delegation as a tournament reward 👍 The pack generating mechanics change was much needed, well done! and "the linkening" of Steem Monsters and the Steem Engine platform is just the beginning of many great things to come! A great progress in the game! You just got a 0.58% upvote from SteemPlus! the only thing i can suggest, if possible, to be looked at, is how to buy many cards simultaneously. is there something that can be done for this? Bulk purchasing is available at peakmonsters.com ... quick and easy and is the most used market for these cards. thank you. yes i went there and bought some. Go to https://peakmonsters.com/market and login. The Monster Market there has way more options and data available compared to the official Monster Market. I have top level blue, near top green and average other colours plus almost one of each card if you want them delegated to you. Please let me konw. Thanks for gifting a incredible game!!! going to have to test out the deligation. I would imagine a higher tier card would delegate a lot better? Where are they Both to find out? Or was it about the future?